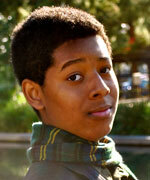 Andrew Washington, a sophomore at Blair High School, is 15 years old and is the youngest of three. He was born and raised in Pasadena and loves to sing, act, and perform. He is in his school’s student government and recently went on 10-day trip to Beijing, China. Andrew is a very fun, passionate, student.